A data point is a unit of observation. When you have a data point of one, you are only observing one thing or one instance. From a research perspective, a data point of one is not just useless, it’s pointless. To get statistically useful information, you need multiple data points. The more data points, the more accurate the research. For example, when you ask for recommendations about something you want to buy, a place you want to visit or someone you want to hire, do you just ask one person or several? One you ask just one person, you are unable to make any comparisons. You also miss out on additional insights you gain by asking other people. It’s just one person’s opinion. Unfortunately, a data point of one, often triggers an emotional response, so people obsess over it. They over focus on it. It gets them stuck. When you ask 3 different people, you are able to see patterns and trends to compare and contrast. You gain context. You’re not just taking one person’s word for it, you are gathering information from multiple sources to make an informed decision. You balance your emotional response with a rational perspective. The three most common ways the data point of one gets first-time entrepreneurs stuck are: 1) opinions 2) sales and 3) new ideas. The most dangerous form of the data point of one is the opinion of others because they trigger an emotional response. It can just take just one email, one social media comment or one piece of feedback to send us into an emotional tailspin that stops us in our tracks. I’ve let one person’s opinion get me stuck before. I’m only human, but now I remind myself, “It’s just one person’s opinion. That’s it.” It’s not enough information to make a decision, so why let it get you off track? One of the toughest aspects of starting your business is maintaining a sales habit. From day one, you have to keep reaching out to potential customers. The more you reach out, the better you get to know them and their needs. However, it’s tough to maintain our motivation when we don’t get any responses to our emails, phone calls and social media posts. When we do finally get a bite, we tend to put all our eggs in one basket. We obsess over that one potential client as if they were the only sale we are ever going to make. We think this data point of one is going to make or break our business, but that’s just not true. What I have learned to do is to get back out there and find even more leads, so you don’t obsess over just one. When you have more irons in the fire, you will come off as more confident. When you obsess over one client, you come off as desperate and ironically, you increase your chances of losing the sale! I don’t know about you, but I can get pretty darn excited about a new idea and pretty quickly! It’s a manic emotional response to the data point of one. It’s the shiny new object syndrome. One new idea distracts me from considering it in the overall context of my business goals and even from comparing other possible ideas. I’ve learned to train myself to literally sleep on it, so the emotional high I’m on has time to wear off! It gives me the chance to regain my perspective. The most effective method for defending against the data point of one is by first recognizing that it’s happening to you! If you don’t realize you are doing it, you won’t know when to put up your defenses. Once you start bringing awareness to your reaction to the data point of one, I recommend using the “Rule of 3” to defend against it. 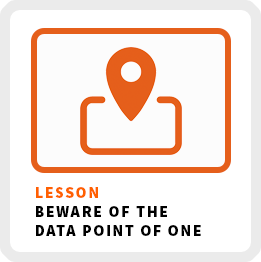 The most effective way to weaken the data point of one is by gaining context. Get at least two other data points to get your mind out of its emotional reaction mode and into its research mode. In the case of opinions, seek out differing opinions from at least two other people or sources. Foe example, the next time you get one bad review or comment, go back and read several positive ones to remind yourself many people appreciate what you do. In the case of sales, if you are obsessing over one lead, make yourself go after two more. In the case of new ideas, seek out two more ideas or alternative options to see which one is most aligned with your goals. And that’s really the point I’m trying to make here. When you respond to a data point of one, you respond out of emotion. When you respond to 3 or more data points, you are making an informed decision in alignment with your goals and thus, a better decision. Don’t let a data point of one get you stuck! Seek out more data to get you unstuck!